We believe that a sense of community can be encouraged in students through the experience of percussion as a participant, both as listeners and performers. We believe additionally that through experiencing the percussion music of many cultures, students may better understand themselves in our multi-cultural world and their community responsibility to each other. We strongly believe in giving the students an arts experience that promotes creativity, inspires their educational success, and instills positive values for their future. The cultural artifacts students find most interesting in music are percussion instruments. Every culture has its own collection of percussion instruments that create its own sounds and music. 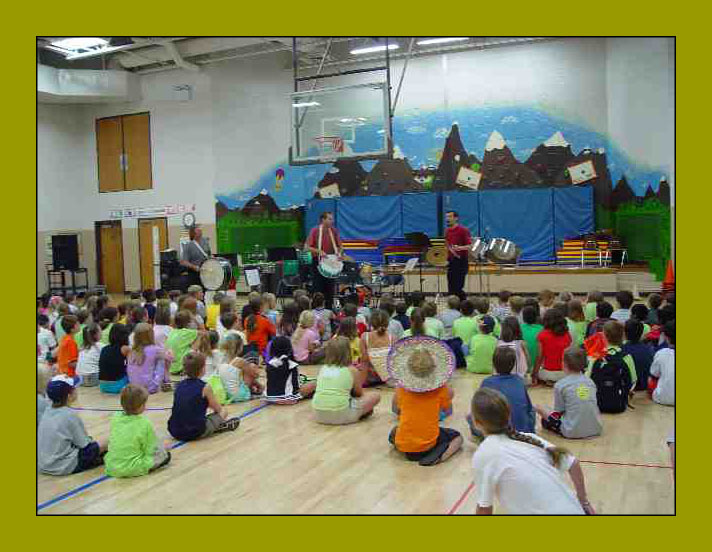 Through the use of percussion instruments, many not commonly found in the music classroom or bandroom, and demonstration of diverse styles and techniques, your students will learn about music from a variety of genres and cultures, an experience that is relevant to their everyday lives. In our optional “hands on” follow-up sessions, we give the students an opportunity to improvise and create, and develop the students' ability to make music “in community.” Whether they are a music student or not, we help the students discover enjoyment through musical expression.